Abandoned and alone in a city infested with zombies, you have no hope for survival. The feeling of being surrounded but isolated is what most zombie/horror stories, movies, and games go for. Yet, in many stories there are at least some other human survivors (for awhile). 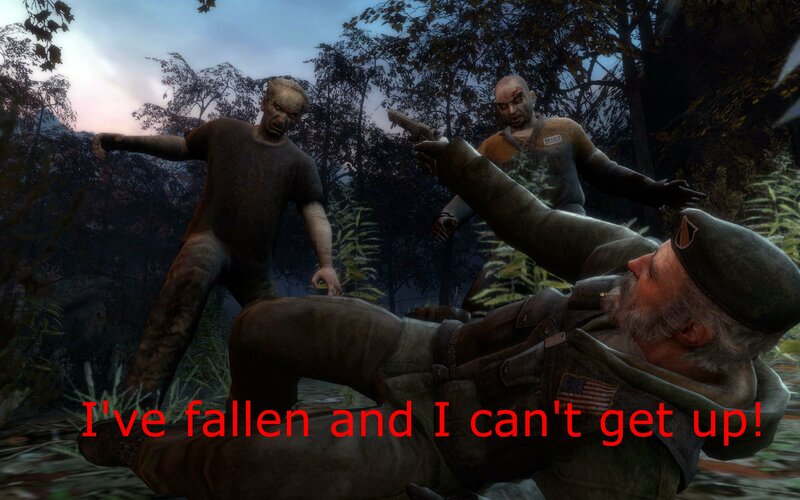 Left 4 Dead centers around this aspect: the teamwork to survive. However, in a traditional zombie movie, four CounterStrike counter-terrorist agents would have little trouble surviving. Something has to be done to make the game challenging for the people who are already excellent at games like Halo or Team Fortress 2. That something is the endless horde of 28 Days Later zombies. Left 4 Dead has no end. No end to the zombies means you can never clear an area; more will always return in a minute or two. There is a campaign of sorts; rather, there are 4 campaigns that string together into a campaign. But these 4 are really just large maps. Even after “winning” all 4 maps, the game plays more like the multiplayer portion of an FPS, rather than the singleplayer. Like winning a CTF match in Halo’s Blood Gultch or TF2’s 2fort, L4D has limitless replay value due to the randomness of the levels and Versus mode. As you play as one of four survivors, you use your guns, reflexes, and teamwork to overcome the horde of mindless zombies that run at you. If this were all there was, the game would get boring, similar to an FPS Gauntlet. However, there are zombie lieutenants introduced in the game; these guys are much smarter and have a wide range of abilities. Their unique audio ques let players know what they are about to face. They can even be controlled by other human players. Left 4 Dead, at its heart, is a co-operative competitive FPS. Much like Gears of War 1, you and your small band of 3 friends must work together to take out the enemy team. This isn’t like an FPS you’ve played before, however. The gameplay is stripped down to be extremely simple and polished, while leaving large amounts of success to be based on speed and teamwork. Or the speed of your teamwork. While most games reward or require you to work together, Left 4 Dead will actively kill anyone who works alone. Like a traditional zombie movie, if you walk off by yourself as a Survivor, zombies will surround and kill you (especially on the higher difficulties). The Infected are surprisingly similar: even as the combat oriented Tank or Hunter, if you go in alone you can expect to be gunned down by an organized group of humans. You must time your attack with the horde of AI zombies and with another player if you hope to inflict any significant damage to a Survivor. This may sound daunting at first, but the beauty lies in L4D’s simplicity. You only have one kind of gun/attack at a time. Like Gauntlet (or TF2), you’ll fill a role in your party and do just one action well. It’s not hard to grasp that a shotgun makes you good at short range, or a rifle good at long. For the more FPS-minded: You can carry an unlimited ammo pistol (upgradable to two pistols if you find another) and a primary weapon. There are only 3 types of primary weapon: Automatic (Uzi upgradable to Assault Rifle), Shotgun (Pump upgradable to Full-Auto), and Rifle (must be found). The primary weapons always appear as a set (either Set 1: Uzi/Pump, or Set 2: Assault Rifle, Full-Auto, Rifle). Picking up a weapon does not actually “take” it. Other players can touch it and claim it as their weapon as well. Picking it up, or picking it up again, offers full ammo. This is counter what most FPS games have been striving for. Picking up a weapon always takes it, preventing other players from using it and forcing players to balance their load outs or prevent them from becoming overpowered by all having the best weapon. All 4 players are free to take 4 Full-Auto Shotguns if they think they can effectively use that combination. The unlimited ammo a gun drop represents is also not an issue since the Survivors must keep moving, can can only use it as a checkpoint to quickly stock up once before continuing to Point B. So, in essence, you can always pick whatever your favorite gun is, and it’ll load up to full ammo. This is similar to picking a TF2 class, but the guns are a bit more standard: machine gun, spread weapon, sniper rifle that will hit multiple targets in a straight line. That’s it. Learn those three and you know the guns of the game. For some that is disappointing. For others, it allows them to pick up and play the game without knowing about how a charged plasma shot will drop enemy shields, but only kinda track the target. The zombies are similar in that each has a basic melee attack, and a single special attack. The Hunter can jump, land one a Survivor, and then melee them without the Survivor being able to fight back. A Survivor teammate must hit the Hunter off, or the Hunter will eventually kill the human. The Smoker plays similar, but instead of jumping, it has a tongue that can pull a Survivor away and tangle them up. The Boomer can spit up vomit on Survivors, which then makes them the target of a bunch of Zombies. You are randomly given one of these classes each time you spawn, and since death comes fairly often during a single match you’ll often get to play as each role multiple times. Each map is large, and even after mutliple playthroughs is difficult to memorize. They are fairly linear, however, so you often do not get lost. Initially, the Devs had a more open world, but found players grew frustrated when given too many options, and while deciding were attacked and killed by zombies. Instead of sacrificing the constant tension, they directed the maps a bit more. No more so than your average CounterStrike or TF2 map, but not as open as a Battlefield map. Deviations from the path are rewarded with extra medpacks, grenades, or ammo. Othertimes, it’s a trap that kills you. Either way, it is fun. In fact, the AI Director has two roles: to make the game fun and to kill you. The Director controls when and were zombies will spawn and attack. This makes levels both random and controlled. When low on health, you won’t find as many zombies, but being the same health as last time in no way guarantees what you will find around the corner. The Director will also control weapon and ammo drops that you find. Overall, it is what makes this game standout and above a simple Co-Op campaign, giving it the endless replayability. I cannot recommend Left 4 Dead enough: to any fan of FPS games, co-op games, Zombies, or playing games online with friends. What I can’t recommend, however, is which version you should pick up. The choice is clearly in favor of the PC version, with future mod support and additional maps that will add on to an already impressive package. However, due to the “limitless replayability” and the hacking of the demo to play custom maps, Valve removed the demo from the store. This means you can’t test to see if it will run on your machine. The source engine may be old, but it is a more demanding game than TF2. The game runes flawlessly on the 360, and if you can mind the controller controls (work well due to the limited actions you can take) and lack of additional content, it is a great experience. It also has official split-screen support for up to 2 people, so you can bring your friend with you online, or play offline with bots. PC Version can be ‘config’ed to run split-screen as well. If you own either a PC or 360, you should probably have L4D for one of them, if not both just to play with all your friends.